The town of Mont Belvieu, Texas, is located along the gulf coast. This geographic region is recognized for the vast underground salt cavern storage facilities. A number of refineries are also located in this area. Many of the companies specialize in the production of light hydrocarbon products. Enterprise Products is a major employer in town. 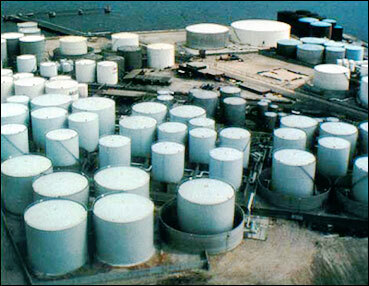 They act as a supplier of hydrocarbon products and also as a storage facility. Their significant storage capability allows them to lease space to a number of companies. Enterprise Products utilizes turbine flowmeters extensively for custody transfer as well as for “balancing” their storage facilities. Balancing a particular storage facility accounts for product removed and product that has been added. This type of application requires a bi-directional turbine flowmeter that is extremely repeatable over a period of time, is accurate, and one that can tolerate the service conditions. Many of the applications at Enterprise are more challenging in that the product is very dry without the usual lubricating properties associated with hydrocarbon products. One flow application that presented particular problems in terms of measurement was for very dry, ultra pure iso-butane coming straight out of the dryer. Enterprise had used turbine flowmeters from another turbine supplier for this application. The Measurement Specialist at Enterprise Products indicates that they had replaced the turbine flowmeter internals on the competitive flowmeter 23 times within a four month period. They contacted Hoffer Flow Controls for a resolution to this problem. Hoffer recommended a bi-directional 4″ Hoffer turbine flowmeter from our API Series of custody transfer flowmeters. Additionally, we recommended a special type of ball bearing that is shielded and self lubricating. Incorporation of this bearing type into the flowmeter would assure that the flowmeter could tolerate the dry conditions that it would consistently be exposed to. Hoffer has successfully used this type of bearing for cryogenic custody transfer applications for hundreds of flow systems supplied throughout the world. The 4″ bidirectional Hoffer turbine flowmeter has been in use for more than five years. Proving of this flowmeter, which includes the original set of flowmeter internals, has shown great repeatability over the years. In fact, the proving data shows the following results. Note: Accurate balancing is extremely critical to any storage facility. Enterprise Products proves this particular flowmeter monthly. They report that the meter factor on this Hoffer flowmeter has been extremely repeatability over the five year period during which it has been installed. The Mont Belvieu Enterprise Products facility has approximately 125 Hoffer API Series turbine flowmeters installed in custody transfer and balancing flow applications. Providing accurate and repeatable turbine flowmeters is what Hoffer does best. 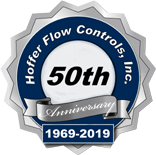 Contact Hoffer Flow Controls to see how their flowmeters can work in your flow applications.